KSRTC Technical Assistant Results 2018: Karnataka State Road Transport Corporation (KSRTC) has organized the written test for mechanical and non-supervisory posts in the month of October. The tests have been attempted by the huge number of competitors on 06th and 07th October respectively. The competition is high for KSRTC posts this year. KSRTC has conducted the written test for various Mechanical Posts include, Auto Mechanic, Auto Body Builder, Auto Electrician, Auto Painter, Auto Welder, Auto Machinist, Technical Assistant; and non-supervisory posts include Assistant Accountant, Assistant Traffic Inspector, Assistant Store Keeper, and Statistical Assistant. Thousands of aspirants have competed for the mechanical and supervisor posts this year. All the competitors can shortly download KSRTC answer keys for 06th and 07th October exams. The answer keys can accessible in KSRTC official website, ksrtc.in. candidates can check more updates regarding answer keys, results, and cutoff marks from the following article. Karnataka State Road Transport Corporation (KSRTC) is the state-level functioning authority that monitors the road transport works. This organization offers various jobs annually for the suitable candidates. This year the KSRTC has released the notification for 1114 Mechanical and Non-supervisory posts. The organization has finished the application process in the months of June/July. The organization received thousands of applications from the eligible and interested aspirants. Screening of aspirants will be done through the written test and interview rounds. Initially, the organization has conducted the KSRTC written test on 06th and 07th October. Candidates who have competed for the KSRTC written test can check the details of answer keys and results from the following article. Aspirants competed for the KSRTC examination can expect the result within 3 to 4 weeks after the examination. The result date will be shortly announced by the organization. Aspirants who got the good merit in the written test round will have the chance to attend the next rounds of the selection process. The results are expected to release in the month of December (tentatively). Usually, the results will be released within 3 to 4 weeks after the examination. Hence the competitors are required to stay patient until the organization announces the result date. 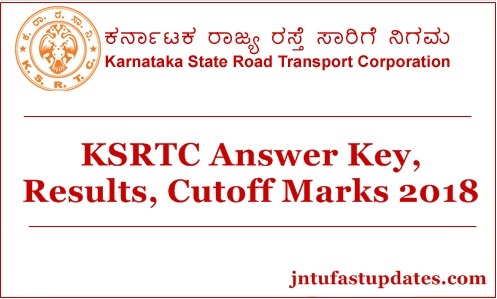 Karnataka State Road Transport Corporation Announced the cutoff marks/qualifying marks along with the results. The KSRTC Cutoff marks category-wise, section-wise will be announced by the organization. Aspirants can check whether they meet the qualifying marks or not to assess their next round participation. KSRTC will release the merit list of qualified candidates in november. Both the cutoff marks and results announced at the time of result. Aspirants can stay checking the KSRTC official website, ksrtc.in to download result, cutoff marks, and merit list. On the homepage search for answer key/result link. Click on the link and enter the required details such as register number, name etc. The result/answer key will be appearing on the screen. Check and take a printout for further reference. Who is selected assistant accountant tell me mobile number i have samall problem. Sir marks related problem a?? Sir technical assistance final least yaavaga bodtaare date Tiilisi…. When is final list of assistant acccount post …dear friends. Kannada &rural kuda ede but list li bandhilla..
Hello everyone, ivaga announce agiro merit list Register number wise bittiddara illa highest marks to lowest marks anno basis mele bittiroda? ? When is cut off release.